For more than twenty years, our family has run Freshella Catering, one of the most successful catering companies in Dallas. Our goal at Freshella Kitchen is to provide our customers with fresh, innovative, and affordable cuisine everyday. Those are the values with which Freshella was established and continues to uphold today. 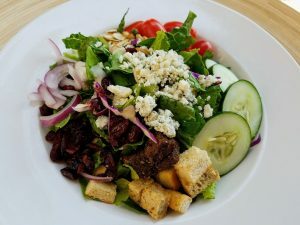 With over forty years of catering and restaurant experience behind us, Freshella Kitchen has created a full-service restaurant which provides busy but health-conscious customers with hearty, delicious meals. While the restaurant has continued to expand over the years, we have remained true to our original vision. It’s for this reason that Freshella Kitchen has built an envied reputation as the go-to restaurant in Dallas. Our customers often ask us what the key is to creating healthy, mouthwatering meals. It’s really not that complicated: Just use fresh and quality ingredients, every time. Our team of chefs is dedicated to combining high-quality, seasonal produce with innovative cooking practices. That’s our promise that sets Freshella apart. We believe there is no substitute for freshly-cooked food, so we always ensure that our meals are made to order. Unlike many other catering companies which reheat pre-prepared meals, the chefs at Freshella only start cooking your food after you place your order. Nobody has time to navigate around complex ordering systems. That’s why we made our online ordering system as quick and easy as possible. Simply select your meal, enter your delivery details, and pay. Your meal will be delivered straight to your home or business, hassle-free. We know many customers are interested in ordering catered meals, but are afraid it’s out of their budget. At Freshella, we offer delicious, affordably priced meals. Your meal can be delivered in a way which suits your particular needs, from convenient packages to more extravagant displays. Who says that convenience needs to be a luxury? Our customers are at the heart of our company, so we take great pride in our exceptional customer service. As a small company, we are able to take a more customer-focused approach to our operations – attention to detail and heartfelt service are standard practice at Freshella. We are constantly updating our menu to reflect new food trends, so you’ll always find something to satisfy your tastes. "The meals I've had there so far were all excellent. They were courteous in delivery as well. The biggest plus is how fresh the food tastes at such an affordable price. The burgers, the chicken, the vegetables even the buns looked, smelled and tasted fresh. I'll recommend this any day. Easiest 5 stars I've ever given." "I love coming here for lunch during my break. The sandwiches are great and their Parmesan fries are soooo good. The turkey club is my favorite and the food comes out quick, which is good for me since I'm always in a time crunch when I come." "Great food and great service! You can really tell this is a family owned and operated. Everything is always so fresh and is served quickly. To top it all off the people are so nice." "Quality food, at a very affordable price for the above-average portion sizes. Low key vibe, yet professional staff. Excellent restaurant!" A Yes, there is $5.95 delivery fee for orders on the 75247 area code and $7.95 for order on the 75235 and 75207 area code. A We deliver within the 75247, 75235 and 75207 zip codes, which is in the immediate area of our restaurant location. Are driver tips included in the total? A Tips are generally not included, and are very much appreciated. Our drivers accept cash tips. It is a pleasure doing business with you, and we thank you for your generosity. AYes, we do! Our extensive catering menu has a variety of fresh, innovative and affordable options perfect for any occasion – meetings, parties, weddings and more! For more information, click on the button below to visit our catering website and take a look at what we have to offer. Be among the first to receive updates on everything that’s happening at Freshella. From special offers to upcoming events, you won’t miss a thing. Fill out the form below and we will add you to our list!